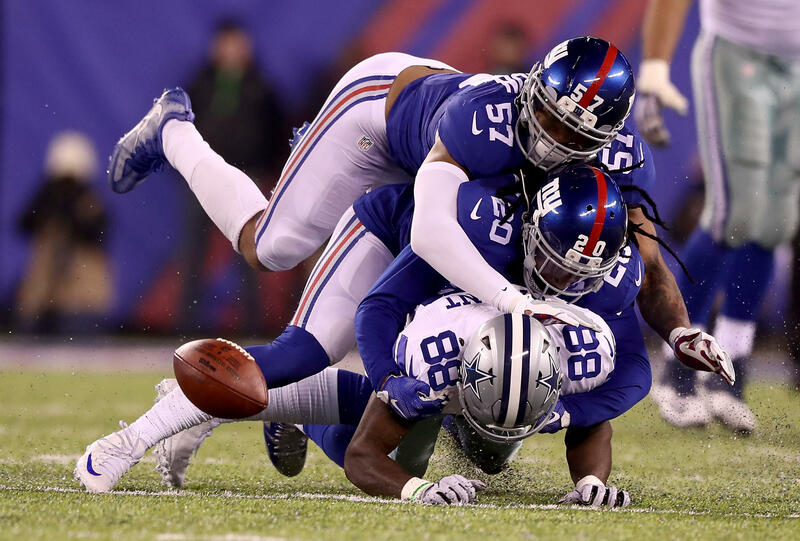 EAST RUTHERFORD, N.J. -- With a no-huddle offense and no-fooling-around defense, the New York Giants snapped the Cowboys’ 11-game winning streak with a 10-7 victory Sunday night, preventing Dallas from clinching the NFC East. Missing star defensive end Jason Pierre-Paul, the Giants couldn’t stop rookie sensation Ezekiel Elliott from rushing for 107 yards. But New York’s pressure stymied the other Cowboys rookie standout, quarterback Dak Prescott, blanked receiver Dez Bryant until 2:13 remained - he fumbled away the ball on that play - and held Dallas to one conversion in 15 third-down attempts. CLEVELAND -- Robert Griffin III returned from injury but couldn’t keep Cleveland from falling closer to infamy as the Cincinnati Bengals built a big early lead and held off the winless Browns 23-10 on Sunday in the snow. Andy Dalton threw two touchdown passes to Tyler Eifert as the Bengals (5-7-1) kept their playoff chances pulsating for another week. Griffin started for the first time since getting hurt in the opener. He couldn’t produce a win for the Browns (0-13). RG3 did score on a 1-yard sneak in the third quarter, but the Browns lost their 16th straight dating to Dec. 13 last season. Cleveland has lost 23 of 24 and 31 of 34 since the end of 2014. The Browns have three games left to avoid joining the 2008 Detroit Lions as the NFL’s only 0-16 teams. They are making history with every loss. They are the seventh team since 1962 to start 0-13, joining the ‘08 Lions, 1980 Saints, 1976 Buccaneers, 2011 Colts, 2007 Dolphins and 1962 Raiders. Griffin finished 12 of 28 for 104 yards. Isaiah Crowell was a bright spot for Cleveland, rushing for 113 yards on 10 carries. Dalton, who has had some of his best games against Cleveland, connected twice in the first half with Eifert as the Bengals bullied the NFL’s worst team for 30 minutes. TAMPA, Fla. -- Streaking Tampa Bay bolstered its playoff hopes by building an early lead and holding off Drew Brees and New Orleans for its fifth straight victory. Doug Martin scored on a 1-yard run, Roberto Aguayo kicked three field goals and an improving defense intercepted Brees three times while holding the NFL passing leader without a touchdown pass. Brees began the day leading the league in completions, attempts, completion percentage, passing yards and TD passes, but failed to throw for a touchdown for the second straight week, the first time he’s done that in consecutive games since 2009. Safety Keith Tandy picked off the quarterback’s final pass on fourth-and-1 from near midfield in the final minute. The Bucs (8-5) have won five straight for the first time since 2002, the season they went on to win their only Super Bowl. New Orleans (5-8) entered hoping to tighten the NFC South race, but instead dropped three games behind division co-leaders Atlanta and Tampa Bay. NASHVILLE, Tenn. -- DeMarco Murray ran for 92 yards and a touchdown, and the Titans held on to and keep a piece of first place in the AFC South. With the win, the Titans (7-6) also climbed above .500 for the first time all season. The Titans came in with the NFL’s third-best rushing offense and the AFC’s top runner in Murray, and they ran right over a Denver defense that came in 28th in that category. By halftime, the Titans ran 26 times for 138 yards - the second-most rushes by any team in the first half this season and most allowed in the first half by Denver since 2014. Tennessee then had to hold on as Trevor Siemian tried to rally Denver (8-5) despite a sprained left foot that kept him out last week. He threw a 3-yard TD pass to Emmanuel Sanders with 9:58 left and drove the Broncos to first-and-goal at the Tennessee 7 before rookie Aaron Wallace sacked him. Coach Gary Kubiak settled for a 34-yard field goal by Brandon McManus on fourth-and-goal at the 16 with 4:28 left. Siemian was driving the Broncos again when A.J. Derby fumbled after a catch. Safety Daimion Stafford recovered with 53 seconds left, and the Titans finished off their biggest win in years. GREEN BAY, Wis. -- Aaron Rodgers passed for 246 yards and three touchdowns and Green Bay routed Seattle. Seattle’s Russell Wilson threw a career-high five interceptions and the Packers (7-6) won their third straight game to keep their playoff hopes alive. They’re two games back of first-place Detroit in the NFC North, but play division opponents in the last three weeks of the season. Green Bay gained more than 300 yards in the first game for the Seahawks (8-4-1) without former All-Pro safety Earl Thomas, who is out for the season with a broken leg. Rodgers set the tone on the opening drive after connecting with receiver Davante Adams on a perfectly-thrown pass down the right sideline for a 66-yard touchdown. Cornerback Jeremy Lane slipped on the play. PHILADELPHIA -- Chris Thompson’s 25-yard touchdown run with 1:54 remaining lifted Washington. Kirk Cousins threw two touchdown passes, including an 80-yard toss to DeSean Jackson, and had a pick-6. Carson Wentz drove Philadelphia to the Redskins 14 in the final minute, but Ryan Kerrigan sacked him to force a fumble and seal the win for Washington (7-5-1), which remained in the middle of a jumbled playoff race. ORCHARD PARK, N.Y. -- Le’Veon Bell scored three times and set a franchise record with 236 yards rushing in finding traction on a slick, snow-covered field. The Steelers overcame three interceptions thrown by Ben Roethlisberger to win their fourth straight and improve to 8-5 and keep pace in the AFC playoff race. The loss all but mathematically eliminated the Bills (6-7) from contention, and puts them in jeopardy of extending the NFL’s longest active playoff drought to 17 years - the longest since New Orleans ended a 20-year drought by reaching the postseason for their first time in 1987. After scoring in the first half on 3- and 7-yard runs, Bell put the game away on the opening drive of the third quarter. He had nine rushes for 72 yards alone and capped the 82-yard drive by waltzing into the end zone from 5 yards . LOS ANGELES -- Matt Ryan passed for 237 yards and three touchdowns and Atlanta forced five turnovers to beat the Los Angeles. Deion Jones returned an interception 33 yards for a touchdown, and Vic Beasley forced a fumble by Jared Goff and returned it for another TD during Atlanta’s comprehensive pummeling of the Rams (4-9), who have lost four straight and eight of nine in their increasingly miserable homecoming season. Tevin Coleman caught a TD pass and rushed for another score for the Falcons (8-5), who opened up a 42-point lead in the third quarter and stayed atop the NFC South with their fourth win in six games. Even without injured receivers Julio Jones and Mohamed Sanu, Atlanta had little trouble from the opening kickoff, which was fumbled by Rams rookie Michael Thomas and recovered at the Los Angeles 3. JACKSONVILLE, Fla. -- Matt Asiata scored on a short touchdown run, Kai Forbath kicked four field goals and the Vikings won for just the second time in nine weeks. Asiata had a chance to score three times, but he was stopped on a fourth-and-goal run in the second quarter and fumbled at the goal line in the fourth. Those mistakes hardly hurt against the hapless Jaguars (2-11), who dropped their eighth consecutive game and fell to 0-6 at EverBank Field this season. Sam Bradford completed 24 of 34 passes for 292 yards and a touchdown. His 3-yard TD toss to Kyle Rudolph with 2:13 remaining sealed the victory. Vikings coach Mike Zimmer returned after a one-game absence and was on the sideline. Zimmer missed last week’s game against Dallas because of a detached retina and was unsure earlier in the week whether he would be on the field or in an upstairs box. Zimmer, who needed a doctor’s clearance to fly to Jacksonville, was wearing a patch over his right eye. He also had protective glasses on beforehand, but ditched those when the game started. INDIANAPOLIS -- Lamar Miller scored Houston’s only touchdown and the Texans defense stopped Andrew Luck on Indy’s final drive. Houston (7-6) retained a share of the AFC South lead with Tennessee by ending its three-game losing streak. The Texans won for the second straight year in Indy, have won nine straight against division foes and got their first sweep of the Colts in franchise history. Luck drove the Colts (6-7) to the Texans 42-yard line with 1:24 left. But on fourth-and-1, a blitz forced an errant screen pass to Robert Turbin. Miller finished with 21 carries for 107 yards, while Brock Osweiler was 14 of 24 for 147 yards with one interception. Luck was 24 of 45 for 276 yards with two TD passes, two interceptions and one fumble. T.Y. Hilton had nine catches for 115 yards and a 35-yard TD catch that closed Indy’s deficit to 19-17 early in the fourth quarter. CHARLOTTE, N.C. -- Carolina’s defense forced five turnovers by Philip Rivers and had five sacks and a safety. Cam Newton was a pedestrian 10 of 27 for 160 yards with one touchdown pass and one interception for Carolina (5-8), which snapped a two-game losing streak and kept its slim playoff hopes alive. Jonathan Stewart ran for 66 yards and a touchdown and Graham Gano had four field goals. But it was Carolina’s defense that set the tone early - and later put the game away. Despite playing without middle linebacker Luke Kuechly and defensive end Charles Johnson, the Panthers had four sacks on Rivers and forced three turnovers in the first half to build a 23-7 lead. One of those turnovers, a strip-sack by Kawann Short, proved extra costly for the Chargers (5-8). Running back Melvin Gordon, who came in averaging 117.5 yards from scrimmage and had scored 12 touchdowns, was carted off with a hip injury after his left leg twisted under a pile while attempting to recover the loose ball. He did not return. The Chargers later lost defensive end Joey Bosa to a neck injury. MIAMI GARDENS, Fla. -- Ryan Tannehill threw three touchdown passes before being sidelined with a knee injury, and Andrew Franks kicked a 21-yard field goal as time expired. Tannehill limped to the locker room late in the third quarter after being hit around the legs by defensive tackle Calais Campbell as he released a completion. The Dolphins led 21-9 when Tannehill departed, and backup Matt Moore failed to lead Miami to a first down in his first three series. The Cardinals mounted touchdown drives of 99 and 50 yards to tie the game, but Miami forced a punt to start at the Arizona 47 with 1:29 left. Moore threw a 12-yard completion to Kenny Stills for a first down, and then threw long to Stills for 29 yards to set up Franks’ winning kick. The Dolphins (8-5) won for the seventh time in the past eight games and helped their bid to end an eight-year playoff drought. The Cardinals (5-7-1) fell further behind in the race for the final NFC wild-card berth. DETROIT -- Matthew Stafford ran for a go-ahead, 7-yard touchdown with 3:17 left after throwing two interceptions in the fourth quarter, one that was returned for a score on the previous possession. Matt Barkley completed two passes that put the Bears in a position to at least attempt a tying field goal in the final minute, but both were negated by penalties, before Chicago turned over the ball on downs from the Detroit 44. The NFC North-leading Lions (9-4) have won five straight and eight of nine, moving them a step closer to winning a division title for the first time in 23 years. Chicago (3-10) has lost four of five. Stafford was picked off twice after he threw only one interception the previous eight games. Demontre Hurst intercepted Stafford’s pass in Chicago’s end zone after it ricocheted off teammate Bryce Callahan and receiver Golden Tate early in the fourth quarter. Cre’Von LeBlanc returned an interception 24 yards midway through the fourth to put Chicago up 17-13.